We just caught up with Glee executive producer Ian Brennan at the Monte Carlo TV Festival and he shared lots of scoop about season three, including that the Boss himself, Bruce Springsteen, is on the show's guest-star wish list. Can you tell us who some of the guest stars will be next season? Who would you love to have? Bruce Springsteen as a motivational speaker. Have you ever contacted him? No, we are still on hiatus, and we won't start writing for another couple of weeks. We have sat down and talked a little bit about where we want the show to go but we haven't written anything yet. Are you going to change any of the cast in season three? We aren't going to change the entire cast, but some of the cast will graduate. I just think we would be missing a beat if we didn't acknowledge the fact that a huge part of high school is graduating from high school, and that's going to give us a lot of stuff to write to in season three. Every time we bring in a new character it's worked out really well, we've been very fortunate. We get to sort of start new—we get to bring in new characters and write new storylines. That was one of the big surprises of season two, the new characters just seemed like they had been there together forever. So bringing in new characters will allow us a little more flexibility and will add to the longevity of the show. Do you have any specific types of characters in mind that you'd like to introduce next season? The reality show has cast a character that is very exciting. I can't even tell you whether it's a guy or a girl, but we are very, very excited about the prospect of bring on this new person. It going to be really, really good, and totally interesting something we had totally not thought of. This person coming onto the show is going to add a really, really, funny dynamic. But there's all kinds and that's what I think is exciting about the show, it's sort of a naturally diverse cast. By doing a show about an American high school you get all types thrown in, and we want to continue in that tradition. Are they going to win Nationals next season? I don't know, maybe. I think they should compete internationally. Maybe we'll have them compete in Paris or something. Is it hard to keep the show fresh? Yes, just the volume you have to write and doing a new episode every eight days is a lot. There's just the three of us, and we've written 44 scripts now which is pretty unheard of in network television. We throw out a lot of ideas because we don't think they're fresh enough, and that's the thing at the forefront of our mind—just to keep it funny and emotional and not boring. Those are the three things we think about all the time. And it is hard and there are usually three or four episodes every season which aren't as good as the others. But then the converse of that is you'll have four or five episodes that are really great. There will be scenes that I'll watch in postproduction and the hair on my neck will just sort of stick up and that doesn't happen to me on other network shows I watch. I love that about the show. Is there any formula that you use when writing—like do you need a certain number of songs each episode? That is something we struggle with, how many songs to have in each episode. We have had as few as two songs and the episode has worked, and we've had as many as 10 and the episode has worked, and in other shows it feels like there are too few or too many and that's something we've yet to figure out. What you don't want to do is have the music scene just arbitrary, where they're just singing suddenly for some reason. Integrating the songs into the story the best we can is always the challenge. I, for one, would like to do a show with no music...we can't because of the nature of the show, but I think it would be interesting. You may have noticed we usually have a song before the first commercial break and that's something we learned. We have had shows where we didn't do that and it just wasn't right. We'd look at it and say "What is wrong with this? Something just isn't right." And that's something you never could have guessed—that you have to have a song in the first 10 pages of the script. So there is a learning curve. Part of what is exciting about the show is we didn't have a formula, there was no musical show that had worked in decades and so we just started from scratch. And so as writers we just continued to find our way. We'll try stuff out and we'll try to push boundaries. In the second season we thought, wow, what can we do to keep this interesting, even structurally, and I think some people like that and some people don't. But we are constantly trying to keep it interesting in a fundamental way from keeping it from turning into something you tune into and say, "Yup, it's the singing kids." We just want it to be more than that. Elsewhere today you said you share a certain worldview with Sue (Jane Lynch)—which is a little disconcerting. Can you explain what you mean? I think everybody has a mean side and I didn't realize it, but I have just a biting sense of humor sometimes. I am very nice, I think I'm affable—but I'll also have these very mean thoughts all the time. I think what's so great about that character is you get to write the meanest thing you can. And she's not the only mean character—Santana (Naya Rivera) is super, super mean. But somehow it works. In the context of such joy and happiness you need that voice to cut against the sweetness of it. You need those characters to be more cynical than the most cynical viewers, so you've outcynicalled your audience. It's our way of winking to our audience, saying, "We know this is a crazy world, just enjoy it, we'll make fun of ourselves so you don't have to." Which Glee kids seem most ready to graduate? 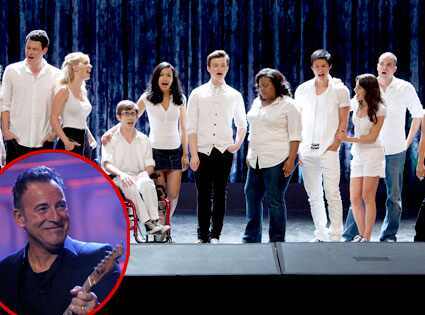 Do you think the Boss would do Glee?